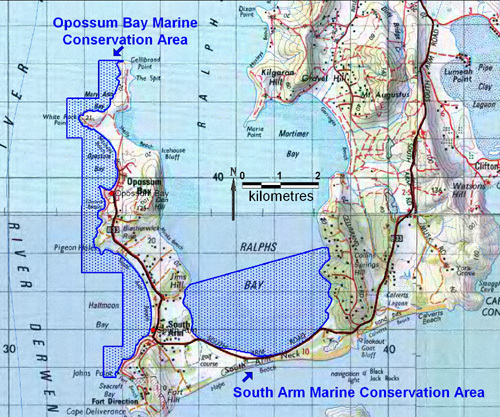 The South Arm Marine Conservation Area encompasses 772.4 hectares within Ralphs Bay in the vicinity of South Arm. The reserve contains a large area of tidal sand flats which support an inter-tidal ecosystem with associated shallow sediments, microalgae and invertebrates. The area also provides important habitat for shorebirds that feed along the shoreline and tidal flats; including sandpipers and species such as pied oystercatchers (Haematopus longirostris) and red-capped plovers (Charadrius ruficapillus). The area has high conservation significance for migratory shorebirds such as the eastern curlew (Numenius madagascariensis) - listed as endangered under State legislation. The large expanses of tidal sand flats within the reserve are a significant conservation value and are listed as a Tasmanian geoconservation site, known as Ralphs Bay Tidal Flat. The area is significant as a scientific reference and monitoring site for migratory birds and other inter-tidal estuarine habitats and species, and contains a shark refuge area, and habitat for the endangered spotted handfish (Brachionichthys hirsutus). The conservation values of the tidal flats at South Arm have long been recognised with the area having first been reserved as a wildlife sanctuary in 1991 to protect wading birds. The marine component of the reserve area was proclaimed as South Arm Marine Conservation Area under the Nature Conservation Act 2002 on 9 December 2009. This reserve class provides for the protection and maintenance of the natural and cultural values of the area and the sustainable use of natural resources. Fishing is permitted in the reserve. Rules and regulations relating to recreational fishing in Tasmania can be found in the Recreational Sea Fishing Guide.